- to build exact models. The necessary information is structured in 90 externally visual characteristics - all illustrated by photographs. In addition the usual troop modifications are discussed too. As an important additional information there are a lot of photographs of all variants, placed in chronological order as accepted by the Armament Office. 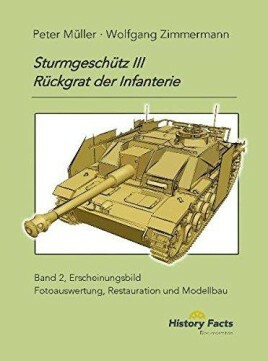 4-side-drawings in modeller scale 1:35 of all variants, Ausf G shown in quarterly steps, round up the tables and photographs. The drawings may be acquired in other scales via HistoryFacts. Our documentation >Assault Gun III . Backbone of the German Infantry, Volume II< contains 296 pages of 20x28 cm. The book supplement, a poster of 135*75 cm, presents all 90 characteristics in a tabulated overview. The documentation contains about 550 photographs, some of them unpublished hitherto, and about 100 graphics, most of them in modeller scale 1:35 !